The recent vote in the House of Lords to decouple TEF results from fees might have looked like a victory for the inflation-denial arguments of the NUS. But a couple of reflections are worth making: a) the House of Lords doesn’t make the laws, so this will bounce back to the Commons; b) the members who made the winning arguments were explicitly not opposed to inflationary fee increases, which they suggested should happen at all universities regardless. So smashing the TEF may be a pain-pain result for students: i.e. they lose the power of the TEF, with its agenda-shifting link to fees; and they get fees rise in line with inflation regardless. My prediction, by the way, is a fudge: inflationary rises for all universities, on the condition that they enter a pass-fail TEF. Just a prediction, though. Finally, while people from all angles are denigrating the NSS, look what happens when journalists conduct their own student satisfaction surveys. Is this what we want? The government is determined to maintain a link between the TEF and fees, but is buying itself some wiggle-room as it tries to push through the HE Bill. To make sense of the amendments, I recommend the excellent Andrew McGettigan. The National Union of Students is calling for a boycott of the 2017 National Student Survey. The argument goes that once the NSS is used as a metric to inform the Teaching Excellence Framework – as is now happening – it becomes implicated in the commercialisation of education. Hence – or so it’s claimed – by boycotting the NSS students can undermine the TEF and derail fee rises. As a long-time lover of the NSS, I share the frustration that it should be monetized in such a crass manner. But I believe that the boycott is based on wonky logic, and will only hurt those the NUS represents. 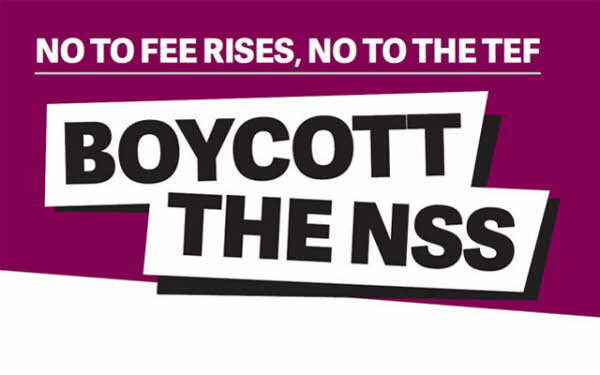 Students, please, don’t boycott the NSS. The TEF, according to the NUS, is a vehicle designed to increase fees. But I’d argue precisely the opposite: it’s designed to suppress fees. My logic depends on a thing called ‘inflation’. The £9000 that a student was paying four years ago is not the same as £9000 today. Hence the government’s decision in 2010 that £9000 was a fair price for 2012 entrants leads logically – or should have done – to a principle of rises in line with inflation. Did anyone seriously believe that £9000 would remain the maximum price indefinitely? The only reason we are where we are, in fact, is that the government neglected to future-proof the system. That was stupid, but it was also politics. And the political fix now is not a rise; indeed it’s not even a commitment to maintaining funding levels in real terms. It’s a commitment to reducing funding for universities. This is because only some universities will be allowed to increase their fees in line with inflation. Others – those that receive ‘silver’ or ‘bronze’ ratings in the TEF – will experience real-terms cuts since their students will pay less, in real terms, than those of previous years. Students and staff alike really should be bloody angry about this assault on universities’ finances. And I’m aware, by the way, that some people will argue that £9000 was not a fair price in the first place. I’m also aware that some see the TEF as a kind of stalking-horse, that will open the door to more fundamental deregulation of fees. And I’m aware, above all, that very many of us regret the state’s withdrawal of public funds for higher education. But the fact remains that, given where we are and the system in which we’re working, what look like fee rises are really nothing of the sort. I don’t much like the TEF. I think it’s unnecessary because standards are already high; I think it’s an instance of government fussing about stuff it doesn’t much understand; and I think the infantile ‘gold’, ‘silver’ and ‘bronze’ tags will make us all look ridiculous. I also rather suspect it might collapse, or at least metamorphose into something quite different, under the weight of its idiocy. But I don’t think that a boycott of the NSS will do anything more than make the TEF worse. Participation rates will drop in response to the NUS position, but not enough to trouble anyone at a senior level. I mean, just about all the TEF data are already wobbly one way or another; this is a low-expectation environment. The data will be less valuable, because some of the most politically engaged students will withhold their opinions. But probably the only people who will notice the difference will be those of us at department level who really, deeply care about the NSS because we profoundly value our students’ opinions. A boycott will hurt us, but the TEF will roll on regardless. What’s so smart about saying nothing? I’ve read plenty of people arguing that the TEF is not really assessing teaching quality at all. That’s fair enough at a theoretical level: we can all see that satisfaction and graduate outcomes are not precise measures of teaching quality. But it’s nonetheless ridiculous to argue, with the NUS, that the NSS does not ‘have anything to do with teaching quality’. In actual fact the NSS is a pretty good proxy for measuring quality. Moreover it has been the greatest agent of educational reform that I have known. I’ve seen how poor NSS results can provide a catalyst for major reforms within departments. I’ve also seen how, even within a department getting quite good results overall, the NSS helps academics to rethink aspects of how we work. I could give countless examples, but here are a few. The NSS has put contact hours firmly on the agenda across the sector. Ditto schedules for the return of feedback on assignments, and equally the form of feedback. Now, thanks to the new questions on student engagement, we’re all thinking about the culture and communities within which our students are learning. Of course universities also use good NSS results for promotional purposes. But why does this become, for the NUS, such a terrible thing? Good NSS results are the result of hard, successful work. There are still departments out there getting crap results, and boycotting the NSS will only give them an excuse to hide for another year. So please, please let’s not boycott the NSS. There’s plenty to be angry about, but I can’t believe we’ve reached a point at which saying nothing makes political sense. In fact this campaign feels to me like an insult to students who have waited for three years to have their say. I think those students are smarter than the NUS campaign. Published under a more polite title by wonkhe.com.